Ideally when you watch a Youtube video, it continues to download and buffer even when video is paused. Video buffering continues till you close the Youtube video page or drag the video slider to the end of video timeline. ‘Stop buffering’ option may be required when you are browsing multiple videos and do not want certain videos to buffer and download to prevent unneccessary bandwidth or data download. Now there is new option to stop buffering and prevent video download on any Youtube video. 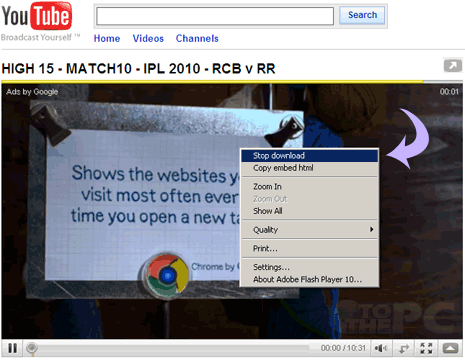 While watching Youtube video, right click on video player screen and click option ‘Stop download’.